Regardless, I wanted to share two of our favorite recipes. One is a more recent find and one was adopted really early into our marriage. Both are super-simple, so I hope you might give them a try as well! One of our more recent finds has been Broccoli Chowder with Cheddar Toasts from the Great Easy Meals cookbook put out by the Food Network. I received the cookbook as a birthday gift last year, and almost everything we’ve made from it has been simple and has tasted amazing. 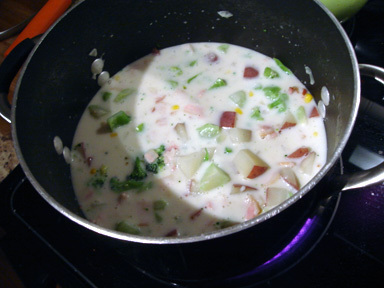 This soup has a great base to it, which means it’s versatile – you can make almost any kind of chowder using the base and I’m fairly certain that it would be excellent. Granted, it has bacon in it, so unless you don’t like bacon it kind of has to be great, right? The first thing we changed is kind of major – we use half a pound of bacon instead of two slices. We use bacon a lot as our protein in the winter because you can use half a pound at a time in soups and get a lot of eating out of it. Especially if you can find a great deal on bacon, it’s a great meat to use. 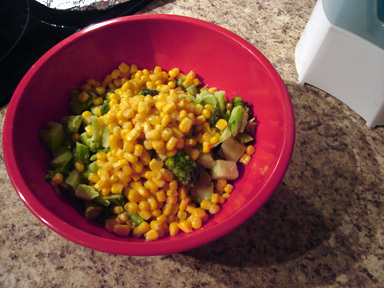 As with just about all of my soups, I add more vegetables than recipes call for, and here we added a small can of yellow corn, the broccoli was frozen rather than a fresh head (for approximately a dollar a bag for the store brand, I love the freshness and convenience of the frozen vegetable section), and I think I put in more potatoes than I’m supposed to, but I love potatoes. It becomes a really colorful and flavorful soup when it’s all put together. Easily good for four servings, and since it uses milk instead heavy cream or half and half to give it its cream base, it’s a lot better for you than most cream soups, too. We also don’t make the “cheddar toasts,” partly because I’m trying to be a bit healthier than cheese broiled on bread most days, but also because there’s something great about how a simple whole-grain baguette or piece of bread just tastes better. At our grocery store, they have take and bake baguettes, which are awesome because I don’t have to make it right away to prevent it from going crusty – I can make it when I’m ready. Whoever came up with that = genius. This last time, we also sprinkled some fresh cilantro from my garden on top. Great light flavor that ties in really well with the whole thing. 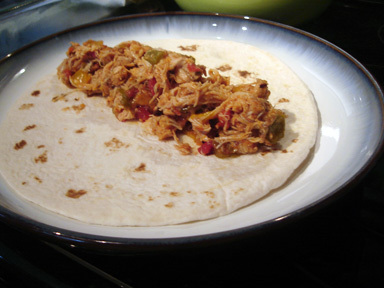 The other recipe is a really simple way to make chicken fajita mixtures, which we turn into enchiladas. I adapted it out of a slow cooker cookbook several years ago, and it’s one of the great meals we look forward to fairly regularly. The first thing is to spray the slow cooker well with an olive oil spray. I prefer olive oil, but you could use most any other cooking spray that isn’t butter (unless you really like butter) – there’s a few varieties to choose from at just about every grocery store. Start layering. Dump the salsa into the bottom, and make sure it coats the bottom before adding more ingredients. You can just pick up the slow cooker and swish it around to do this. Then, place your chicken on top of the salsa. The salsa is your liquid, so this helps the chicken be really tender and fall apart at the end of the cooking process. I love that this recipe is really versatile when it comes to the chicken you use. We’ve tried it with chicken breasts (light meat) and thighs (dark meat), and it has been great every time. You can also use either frozen or fresh chicken pieces, so even if you don’t have time to defrost chicken before putting it in the slow cooker, it still works and works wonderfully. 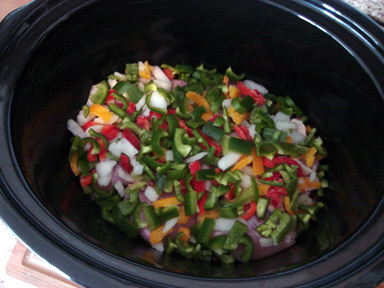 After the chicken, layer in the onions and peppers. If you have extra pieces of fresh peppers lying around (this happens to us a lot, since there are only two of us), feel free to chop those up and add them in so that they don’t go to waste. Cover and cook on low for 8 hours. At the end of the cook time, turn on the broiler for your oven. When the filling is done, break up the meat with a pair of tongs or some forks and make sure the meat is well-mixed with the vegetables and remaining salsa. It should just fall apart. 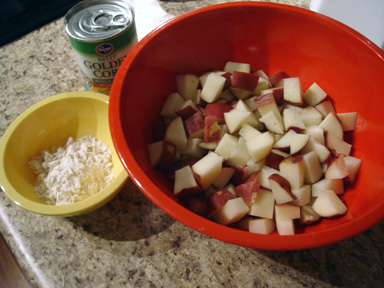 Spray a standard 9×13 baking dish with the same spray used on the slow cooker, and begin rolling the filling into tortillas. For 8-inch tortillas, we use 3/4 cup filling for each, which typically results in 6-8 enchiladas, dependent upon how much chicken mixture you have and/or if you’d like to save some for nachos or quesadillas (it’s a very versatile mixture). 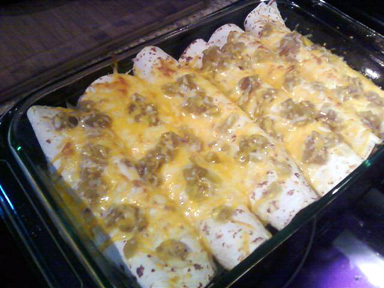 Over the rolled enchiladas, spread out the mild green chilies and the cheese (see first picture from above) and place the baking dish in the oven for broiling. Broil for a few minutes (keep a close eye on your meal) to melt the cheese and warm the tortillas a bit. Some like their cheese a little browned, and some don’t – so I’ll leave that up to you. When desirably melted, remove from the oven and serve with sour cream, fresh cilantro, extra salsa, or whatever you would like to add to your dinner. 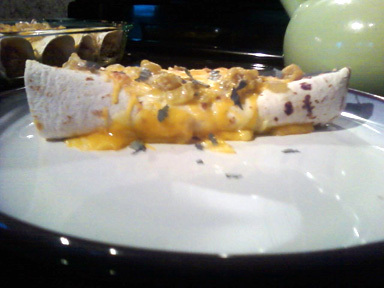 And there you go – simple, tasty chicken enchiladas! These both look delicious, Kate!